What is a castle without a King? 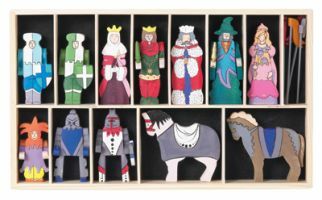 With this Castle Figures set, you don't have to worry about that problem - it includes a complete royal family to rule over the kingdom from their thrones, as well as some renaissance retainers. Enhance your child's pretend play time - this also makes a perfect gift for anyone with 'Castlemania'. Hand carved and painted, these figures are practically an instant heirloom.